Morrissey’s journey to Riot Fest was marred by controversy from the very start. In May it was announced that he’d be playing at the Chicago iteration of Riot Fest, the punk-leaning festival that was also reuniting original members of the Misfits for the first time in 30 years. Less than a week later, a post appeared on Morrissey’s official fan site, True To You, stating that he wasn’t actually playing Riot Fest. He’d eventually state that he was, in fact, playing Riot Fest, though plenty of people wondered if he’d actually show up for his scheduled headlining performance. Even if it was a safeguard by Riot Fest to ensure he didn’t walk off stage due to the smell of cooking meat—as he did at Coachella in 2009—meat-eaters were none too happy with this development. Another rumor began to swirl that, prior to his 8:15 set time, Morrissey requested all trashcans be emptied so that no meat, discarded or otherwise, was on the premises. The A.V. Club reached out to Riot Fest about this claim, which it denied, deeming such a request “logistically impossible.” We also asked if vendors were informed in advance that this would happen, with a possible statement from festival representatives to come. But that’s just the tip of the iceberg. Morrissey brought on another swell of outrage when his 8:15 start time came and went without the singer taking the stage. Instead, fans were “treated” to a 33-minute collection of video clips and songs that served as his introduction. Riot Fest attempted to quell the increasingly disgruntled crowd by tweeting, “Morrissey will be taking the stage momentarily,” even as many attendees made their way to the exit. Even if this collection of clips is standard operating procedure for Morrissey, the delay only gave way to further rumors. The A.V. 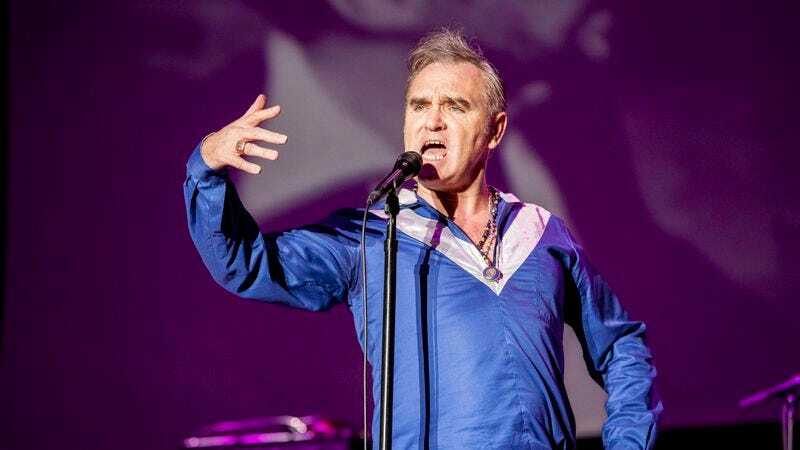 Club was unable to substantiate the claim that Morrissey was angered by the hue of the security guards’ T-shirts, but it’s also within the realm of possibility. Once he hit the stage, Morrissey continued to ruffle feathers, weighing in on this year’s presidential election—which included him stumping for Bernie Sanders—and a performance of “Ganglord” that saw another collection of videos playing behind him. This time, it was all shocking footage of police brutality captured on tape. The audience was visibly uncomfortable, and even more attendees walked out as the video played. And to think, all it took to make Danzig’s anti-photographer stance seem reasonable was to have him play the day after Morrissey.